Down the road stands a building in the solitude of mountains and volcanoes: Immigration. For some mysterious reason the customs office, for the car papers, is another eighty kilometers north from here, even deeper in the middle of nowhere. The landscape is empty, barren, windy and cold. 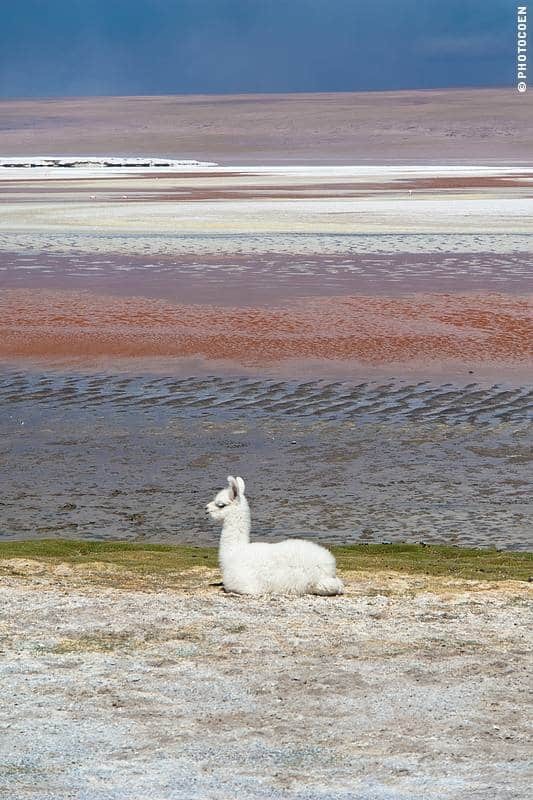 We’re at 4,500 meters, the altiplano of Bolivia, which is home to vicuñas, llamas, three types of flamingos and very few other animals, and even fewer humans. 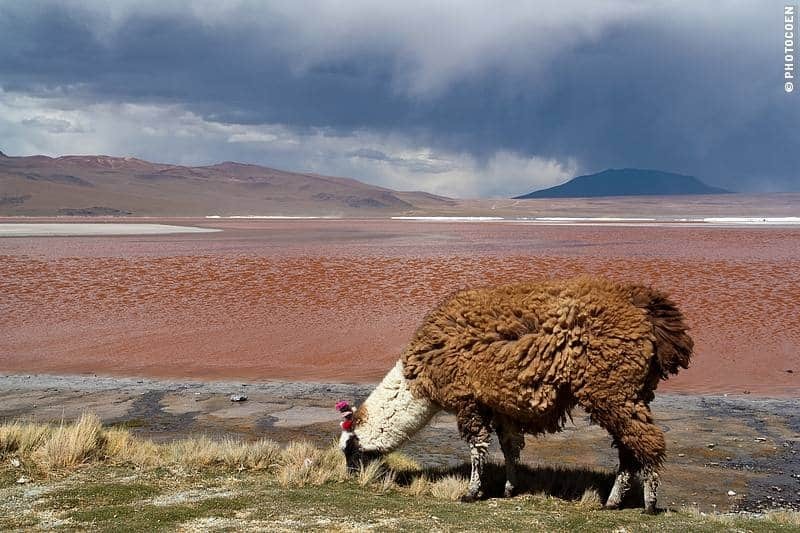 Bolivia used to stretch as far as the Pacific Ocean. 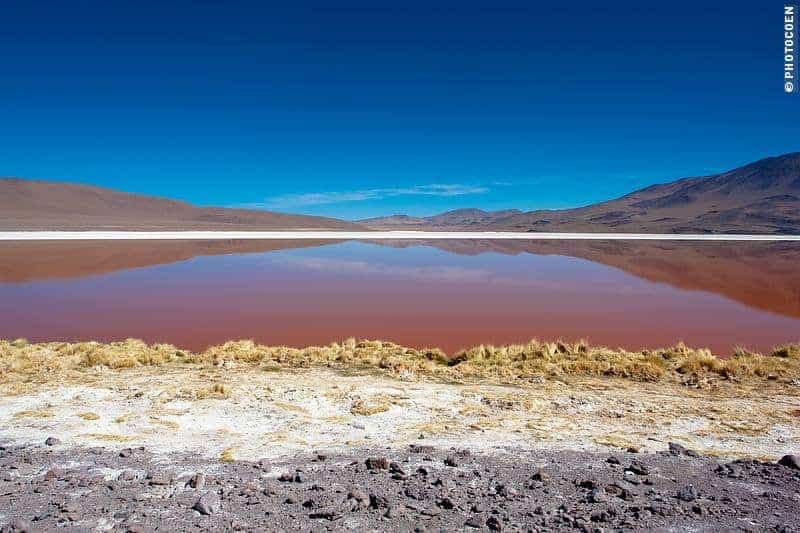 The region between current Bolivia and the Pacific Ocean – the Atacama Desert – contained (and contains) important mineral wealth: copper and nitrate, which was cause for the Pacific War at the end of the 19th century. Chile won and Bolivia became a landlocked country. Eduardo Avaroa was one of Bolivia’s military leaders. 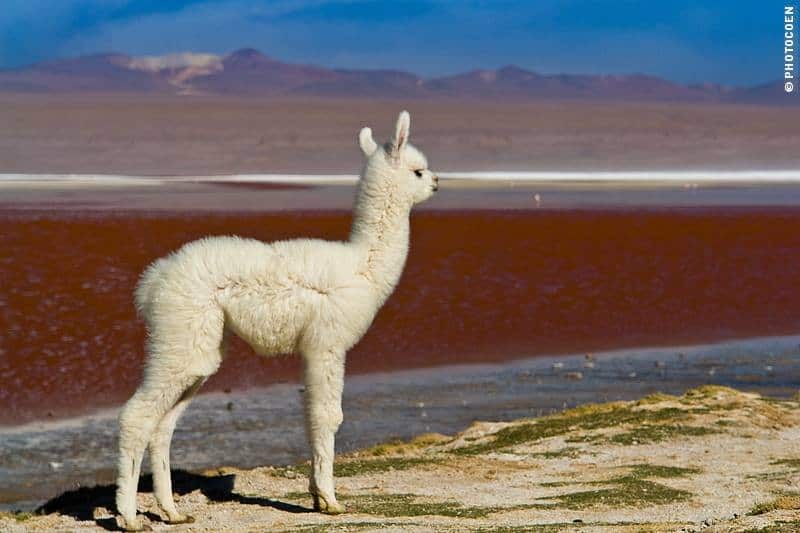 He lost his life in this war and to honor him they named a park after him: La Reserva Nacional de Fauna Andina Eduardo Avaroa, which is the southwestern corner of Bolivia that we are about to explore. Before crossing the border we stocked up on fuel, food and water as between here and Ollagüe there are no facilities whatsoever. 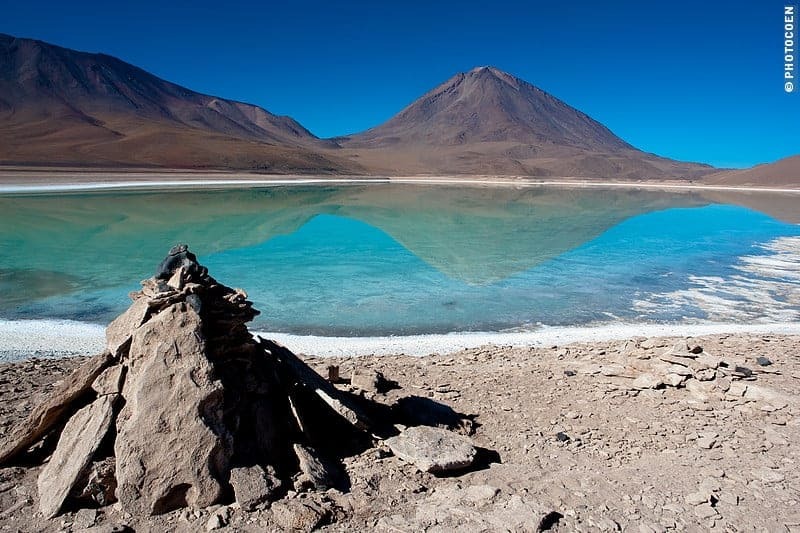 Laguna Verde (Green Lake) is the first colored lake we pass. 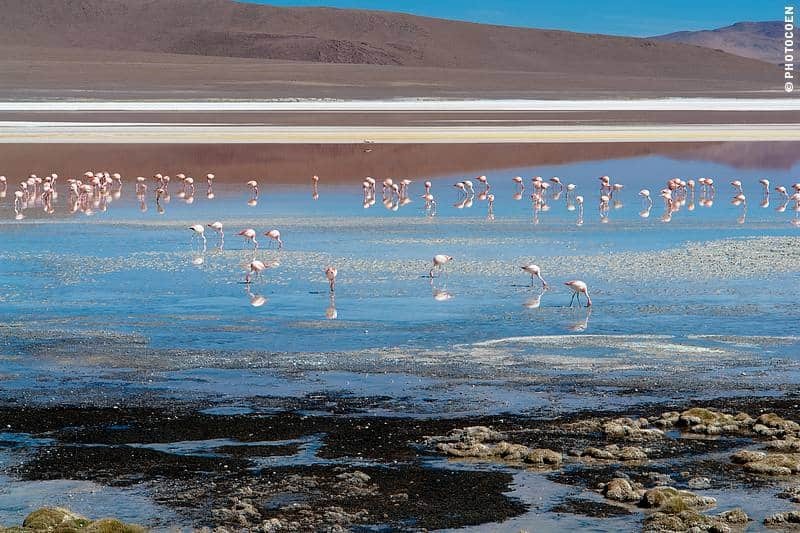 It is a popular place for flamingoes. There are hundreds of them. They appear to be gregarious animals that like to feed in flocks. 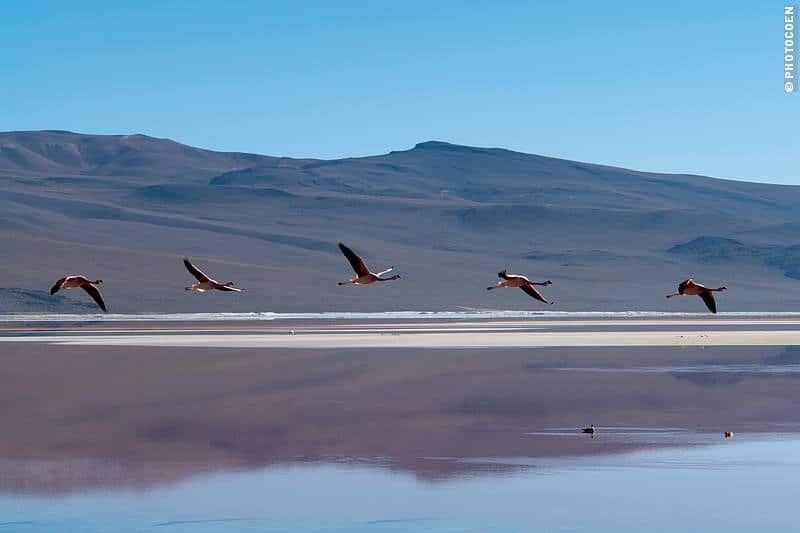 South Bolivia is their summer home, during the cold winter months they live two thousand meters lower, in the salt lakes around San Pedro de Atacama in Chile. We can’t approach them. As soon as we get out of the Land Cruiser they slowly but deliberately head for deeper waters without so much as looking up while continuing scratching the soil for tiny organisms. It’s one of these places we wish we had a camera with a stronger zoom lens. The vast array of tracks that run through this park are sometimes as busy as a highway. 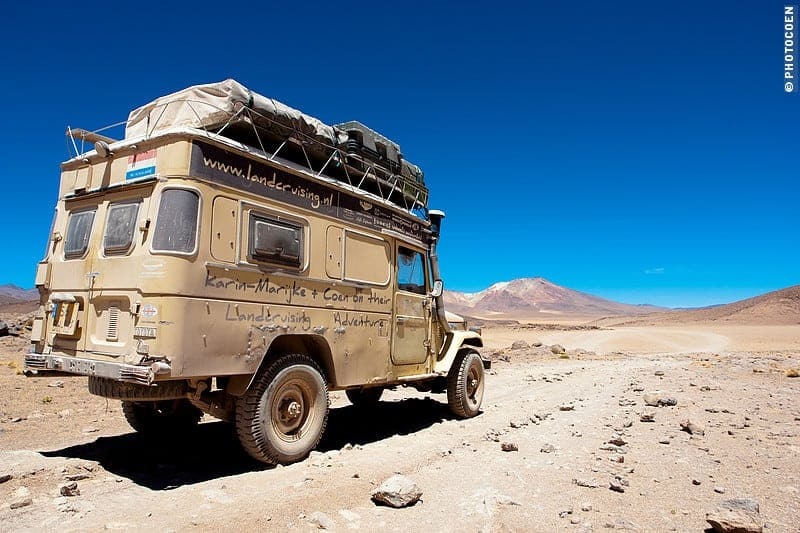 The 4x4s carry six tourists, a driver and sometimes a cook. Luggage goes on the roof, as do the containers with extra petrol. These containers that don’t close properly and are ‘secured’ with a strap of plastic. Travel agencies compete each other to death – sometimes literally. It’s not uncommon for drivers to be drunk or without sleep for more than 24 hours while driving these tracks, sometimes at night. We heard of two fatal accidents. 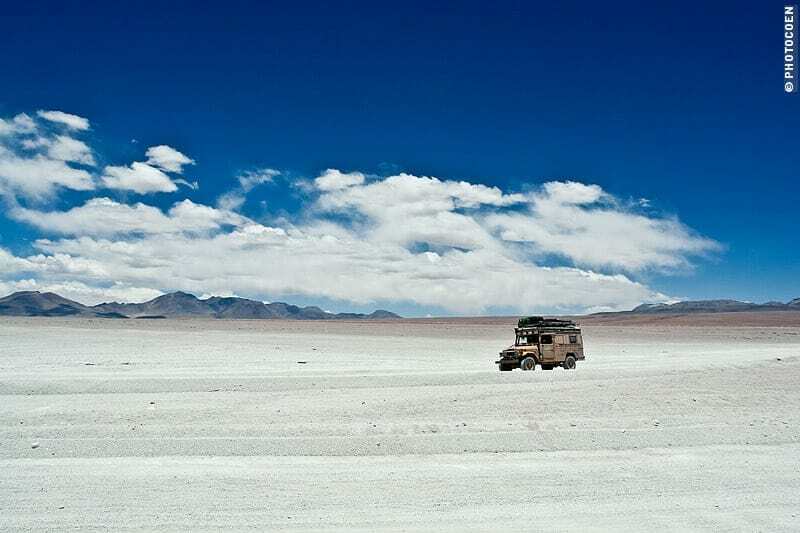 On the wide ocean of Salar de Uyuni, with no obstacles whatsoever, two 4x4s managed to crash into each other. All twelve tourists died. 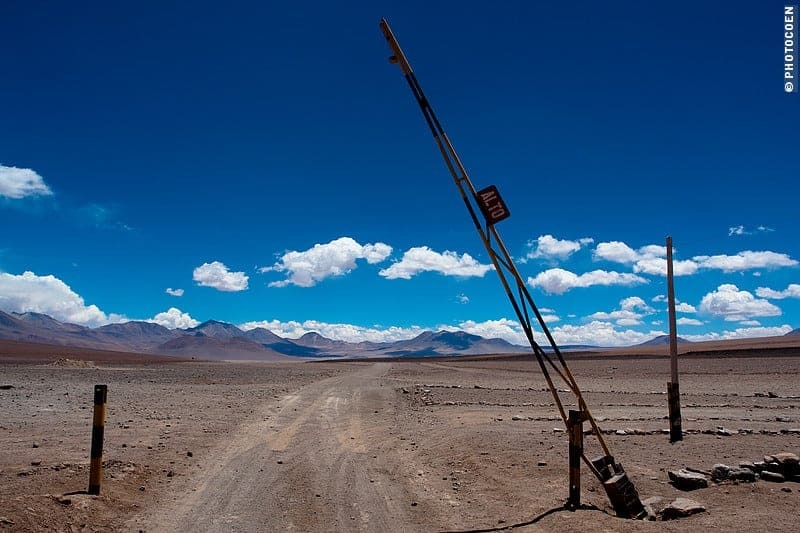 Another time a 4×4 toppled over on the Salar, which is quite an achievement considering the smooth surface. The tragic, of course, was that also here tourists died. The landscape is breathtaking, literally because of the altitude. 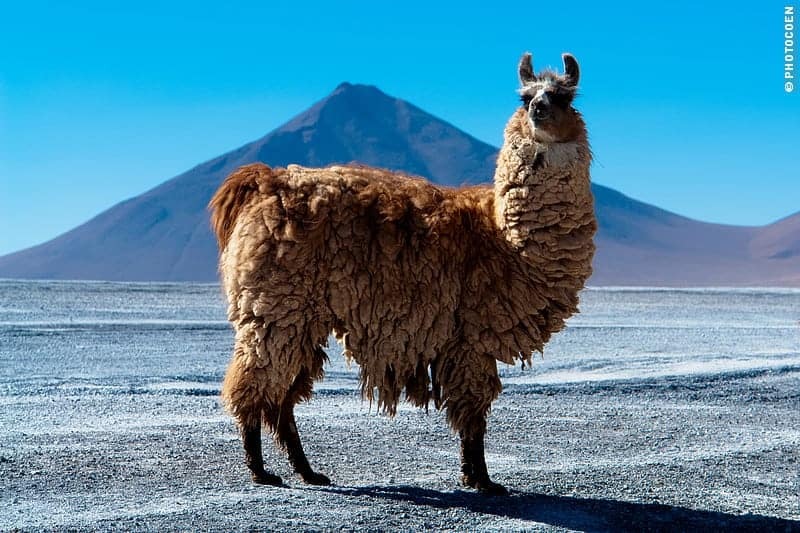 Reddish mountains and volcanoes are home to herds of vicuñas that live on a few tufts of yellowish grass. We encounter the worst washboard imaginable. Driving uphill, from 4,300 to 5,000 meters, doesn’t help. Sometimes we manage a mere 15 kilometers per hour. Why is there no bulldozer to level the tracks? What happens now – and we are as much guilty of this practice as the commercial 4x4s despite our generally strong environmental awareness – is that drivers leave the tracks to search for a smoother way. As vegetation is easily destroyed on this altitude but can hardly recover, this is disastrous and a shame for a place called a Reserva Natural. 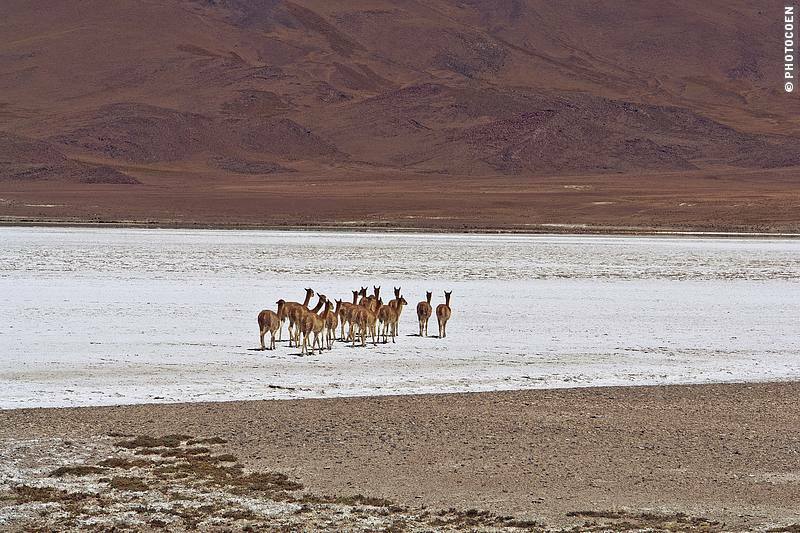 Salar de Chalvri is one of the many salt flats in this region. It has a thermal bath but we leave it to others after we severely got sunburned in a thermal bath we took yesterday. We see more flamingos, this time with yellow beaks and fewer black hues than the ones we saw in Laguna Verde. 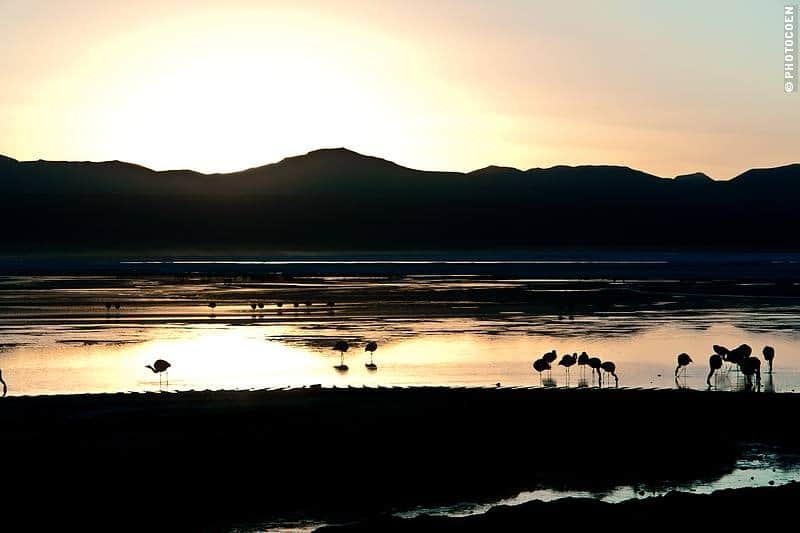 There are three species of flamingoes in this part of the world: James, Andino y Austral (Phoenicoparrus jamesi, P. andinus y Phoenicopterus chilensis). We continue plowing over endless washboard to see some fumaroles. Fortunately we have a GPS waypoint as there is no sign showing the way and they are not within the vicinity of the road. Without the GPS we wouldn’t have found them. The geysers boil and bubble with dark-red, green or grey mud. Any minute we expect the monsters of Lord of the Rings to appear and start the war. One geyser explodes and vapor rises up in the air, sounding like hell let loose. More cursing while ascending to 5,025 meters on washboard. The customs office is quartered in a mining area. We have to wake the official; it’s siesta time. 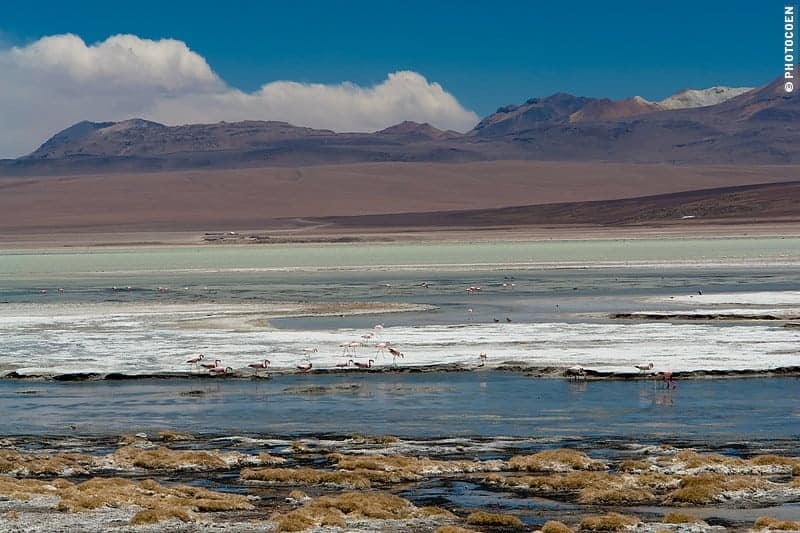 The formalities are taken care of in a breeze and we descend 700 meters until Laguna Colorada stretches in front of us, which is considered the jewel of this region: A blood-red lake (caused by a specific microorganism) lined with snow-white salt, inhabited by hundreds of pink flamingos. 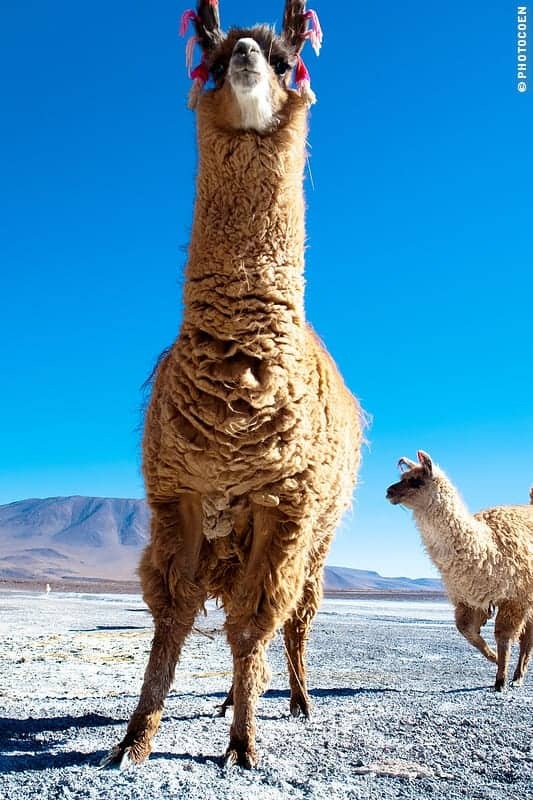 The shore is home to herds of llamas that characteristically are less timid than vicuñas and don’t run away when we approach them. The views are fantastic but the wind is ruthless and the temperatures are freezing – not our best camping spot in that respect. Beyond the laguna stretches desert. Sand, sand, sand and more sand. 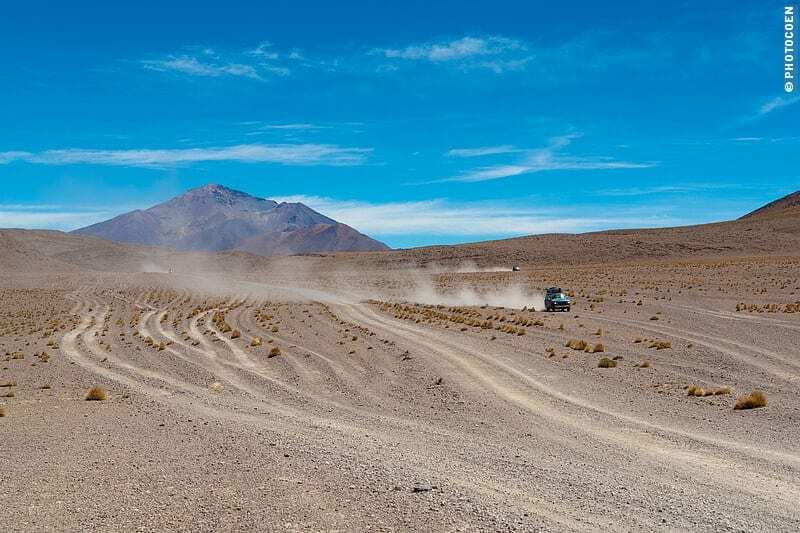 Parts consist of soft sand, where driving ten kilometers an hour feels like speeding. Sometimes walking would go faster. Not that we’re in a hurry but the washboard is driving us crazy. Speeding up a bit would help to minimize the shaking and bumping and we’d like to spare our brand-new engine mounts a bit. Besides, the journey is eating up diesel: 20 liters to 100 kilometers. Tracks zigzag from left to right and we follow the line on our GPS. Suddenly we’re on a dune, which just as unexpectedly stops. Coen hits the breaks in time and we search for a path to go down. With a curve we descend into the dunes and follow the ‘path’ – car tracks in the soft sand. Initially it’s spectacular but when we appear to just continue driving east instead of north we do get a bit anxious and start to bicker about what to do. In low gear Coen spurts to conquer a minor slope in an attempt to leave this hollow, barely succeeding. I sit up straight, hold on to the dashboard, which is non-verbal communication for “I am no longer enjoying.” This behavior makes Coen nervous but I know he is dealing with his own anxiety, which is mainly related to whether we have enough diesel to get out of this wilderness. The wind comes from behind and we are enveloped in our own black smoke from the exhaust. I get out and walk up the dune, hoping to get a view. It’s like a Fata Morgana: The top is forever in front of me and unreachable. I forget that I’m at 4,500 meters and walk too fast while the wind is cold. It is exhausting and my lungs burn. I give up and return. “It seems that there is a turn-off farther left. Let’s give it a try”. Slowly but steadily the Land Cruiser crawls up the dune, we’re impressed with what our antique vehicle is capable of. We reach the top and take a deep breath. More desert: We can choose among washboard, soft sand of a thick layer of volcanic ashes which is just as tough to drive as the soft sand. The car fishtails from left to right as we search for the track with the least resistance. Bare, rough volcanoes are watching from the side. If they were capable of thinking, would they agree what we are doing here? Causing damage to their age-old terrains? I doubt it. The third day I fall in love with the region. 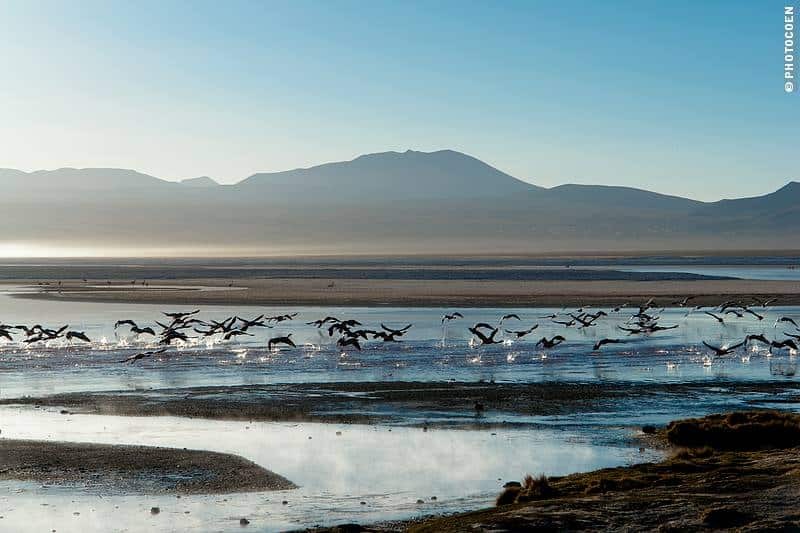 Along La Ruta de las Joyas – the Road of Jewels – are various more salt flats and flamingo-filled lagoons. For some reason I enjoy the colors and views more intensely today and feel more at peace being here. Maybe because yesterday was a bit of a boring, exhausting desert stretch and today there are so many places to stop and take in the views, among which impressive volcanoes with slopes in red, purple and brownish tinges. Today we have to deal with fewer stretches of washboard but the last part consists of rock climbing. From the north the tourist 4x4s are approaching, trying to conquer the same rocky pass. Tourists have to get out of the cars and walk across. Is it to save themselves from unwelcome massages or is it to spare the 4x4s? Even the Bolivian drivers take care and drive slowly. Our Land Cruiser has to work hard. It’s a tough game of nature, car and driver. The challenge adds to the sense of adventure. Driving washboard is just sweating it out. We prefer these kinds of challenges: Rocks and potholes where we have to search for the ultimate way to cross. The main road comes into sight. With it comes a spectacular view of the smoking Ollagüe Volcano, which is surrounded by ancient lava streams. It’s a perfect finish of this three-day off-roading adventure. 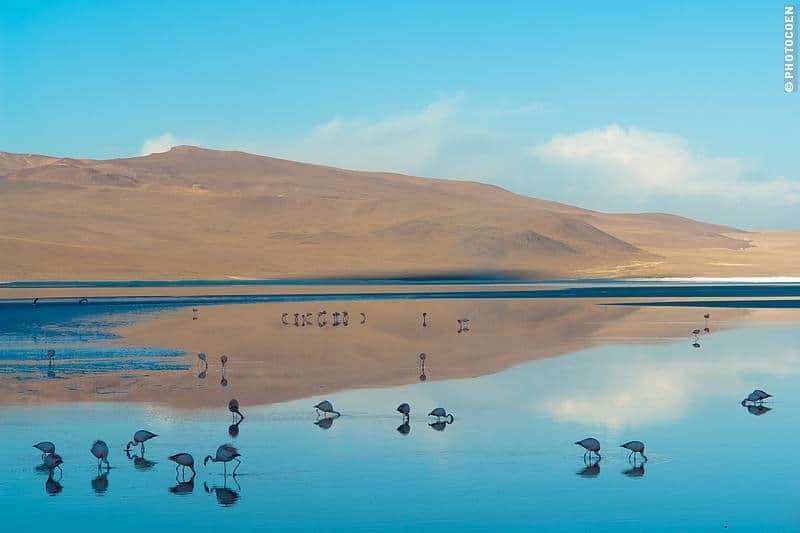 What a wonderful description of your adventure in Bolivia. You carried me along on the trip through the terrain and amazing landscape and even though I wasn’t there I did “see” what you were seeing. Thanks, it was a nice relief for me from class preparation! Good luck with the rest of the trip and hope to see both of you sometime, somewhere, somehow. Dat was wel de bedoeling Wim. Hoop jullie in de nabije toekomst toch weer eens te ontmoeten, buiten Suriname! Well, chances are big that we are going to meet each other on the road somewhere. We wish you all the fun in preparing your trip. And don’t worry, just enjoy! Fijn om te horen. Dank! En blijf vooral genieten!